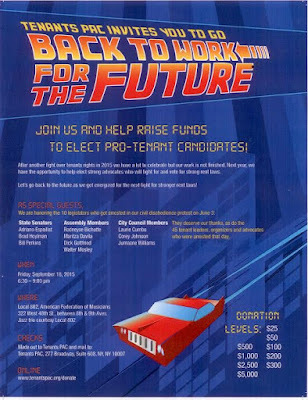 Michael McKee of Tenants PAC writes, "The article discusses . . . evidence in the Dean-Adam Skelos trial. . . that describe efforts by the real estate lobby to stop pro-tenant changes in Albany, including big bucks contributions to the Senate Republicans from the Real Estate Board of NY and Rent Stabilization Association of landlords. The email from Glenwood Management executive Charles Dorego states that the landlords had a mole at tenant strategy meetings. Click on the article and then click "Ctrl+" to make it bigger on your screen. 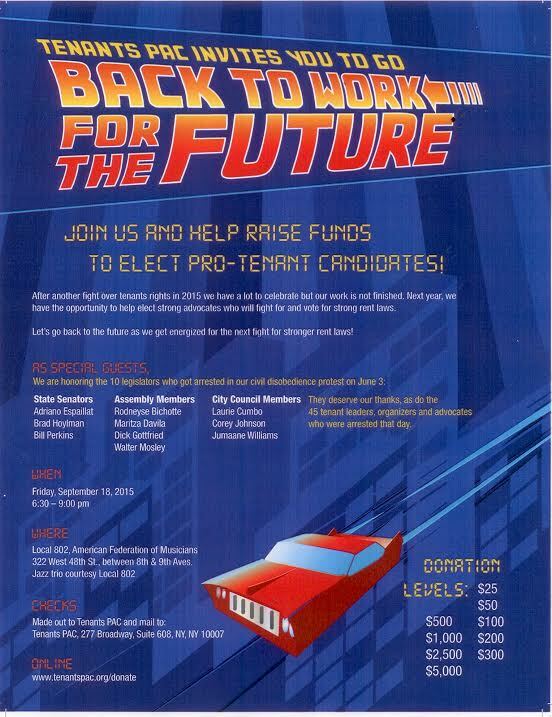 It's time to get Back to Work for the Future! Jazz!!! courtesy of Local 802. New case could re-regulate thousands of apartments!! There was some controversy back in July surrounding Albany's new rent regulation deal, and its language specifying that an apartment had to actually be rented by the departing stabilized tenant before a vacancy at the de-regulation limit—which is currently $2,700—in order for a landlord to legally take it market-rate. A denial of a landlord’s leave to appeal in a recent court case—Altman v. 285 West Fourth, LLC—has solidified and expanded this policy, and sources in the landlord community have told Himmelstein's firm they're waiting for the "floodgates to open" of market-rate tenants seeking to get their apartments brought back under rent-stabilization. Read attorney Sam Himmelstein's important article in full. The new law supports the court decision under the previous law, Altman, decided by NY State's mid-level court. Landlords have been trying to appeal that case, so far without success. If the appeal is denied in Altman, the new law will certainly stand! BRONX, NY: On September 3, 2015, Mayor Bill de Blasio signed Intro. 700 into law, co-sponsored by Council Member Jumaane D. Williams (D-Brooklyn), Deputy Leader and Chair of the Council's Housing and Buildings Committee, which is part of a Tenant Protection Package that aims to address the poor business practices of unscrupulous tenant relocation specialists, or as they are more commonly known, tenant relocators. The package of bills were passed by the New York City Council on August 13, 2015. The rent deal proposed by Gov. Cuomo, Assembly Speaker Heastie, and Senate Majority Leader Flanagan does very little for tenants. If you want more, contact Gov. Cuomo, our State Senator Bill Perkins and our Assembly Member Daniel O'Donnell to vote NO on the "conceptual deal." Rent at which vacant apartments can be de-regulated goes up from $2500 to $2700. Limit the increases to end when the cost of the improvement has been re-paid. Reduce the permanent increase by 1/3. Right now, landlords get a 20% rent increase just because an apartment has become vacant. That motivates them to kick out tenants to get to the vacancy decontrol threshold. As long as vacancy deregulation is in effect, we’re losing affordable apartments. Tenants renting at below the legal regulated rent (LRR) can be hit with LRR increases on lease renewal. Keep the pressure on Gov. Cuomo. Don't let up now! Governor Cuomo is happy to blame the State Senate and even the Assembly for the failure to renew and strengthen the rent laws so far. (Even the landlords want them renewed; the tenants want them strengthened.) Click on the image for the text. KEEP CALLING AND EMAILING GOVERNOR CUOMO. (even if you've done it recently). Legislative leaders and Cuomo agreed late Thursday to extend the old rules for five days — until Tuesday — when they hope a compromise will be ready for legislative consideration. Both the Senate and the Assembly planned to take up the short-term extension Thursday night. “Negotiations… are moving in a positive direction toward a resolution,” said a statement issued by Cuomo, Senate Leader John Flanagan (R-Smithtown) and Assembly Speaker Carl Heastie (D-The Bronx). Will Cuomo meet with tenants now as he met with real estate donors earlier this year? For months, tenants have been reaching out to urge you to stand strong for affordable housing by using your considerable political power to fight for stronger rent laws. Gothamist: What happens now that the rent laws have expired? City & State: Is DHCR able to enforce new rent law provisions? Rent control laws for New York City and the surrounding areas expired at midnight after state lawmakers and Gov. Andrew Cuomo failed to reach a deal on either a long-term extension or a short-term stop-gap measure. Protest Cuomo today at noon in PJs or with sleeping bag. Bring a sleeping bag, or a blanket, or a pillow! Wear your pajamas or nightshirt. Since Governor Andrew Cuomo has refused to stand with tenants and instead is standing with developers and landlords, tenants will be doing a camp out in front of Cuomo’s NYC office at 633 Third Avenue today at NOON to send a message to Cuomo that if he doesn't strengthen the rent laws, 2.5 million New Yorkers will be at risk of losing their homes. Governor Cuomo: Stop playing games! Fight to repeal Vacancy Decontrol! Get your members, your friends and neighbors to call Governor Cuomo, and call yourself, even if you have called before. Tell the Governor that you will hold him responsible if the rent laws are not strengthened. Call (518) 474-8390, press 3. EVERYONE: THIS ISSUE IS NOT WHETHER THE RENT LAWS WILL BE RENEWED – THEY WILL BE. The issue is whether the rent laws will be strengthened. Gov. Cuomo & the Senate Republicans are trying to create a sense of panic so everyone will breathe a sigh of relief when the laws are renewed in their current weakened form. This is a trap into which we must not fall. Stronger rent laws NOW. Assembly Democrats returned to the Capitol on Sunday night for a closed-door conference that seemed to touch on nearly every unresolved issue -- from protections for nail salon workers to rent control -- in the final days of the legislative session. the rent laws have technically expired, tenants are still protected. Tenants in rent-controlled apartments within NYC are also protected. they harass or threaten you in any way, please contact Public Advocate Tish James's special hotline: (212) 669- 7250 or gethelp@pubadvocate.nyc.gov. Cuomo: Tenants Are Watching & We Will Remember. A week ago, Gov. Cuomo called for stronger rent laws and an end to deregulation. Now he says the best he can do is renew them in their current weakened form. A straight extender of the rent laws "as is" would result in a steady loss every year of rent-protected apartments in NYC and the three suburban counties, and an ultimate end of the program. It is likely that this issue will not be decided by Monday. If so, call Cuomo's office again on Tuesday. The more calls he gets on this issue the better! Get your friends and neighbors to call! 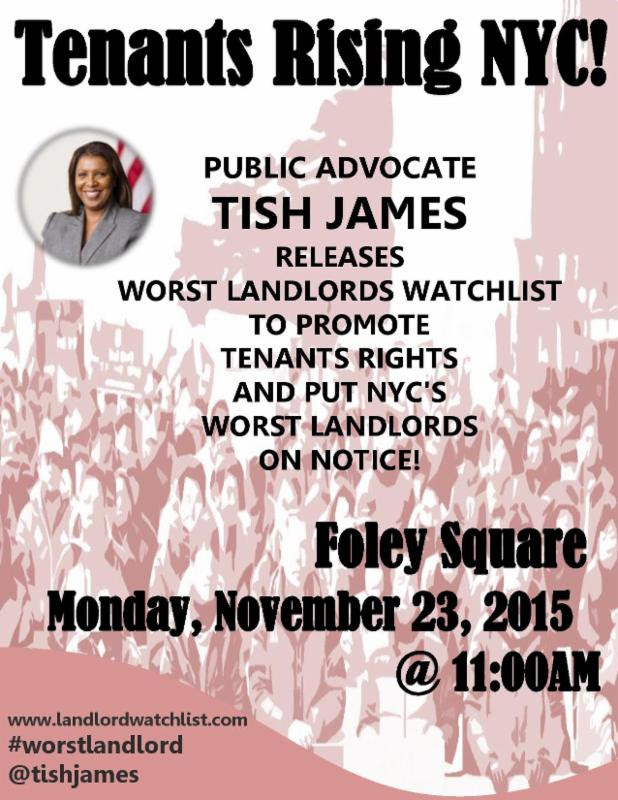 Rent Laws VIGIL TONIGHT ,SUNDAY, 6:00 PM at 633 Third Ave. Governor Cuomo: Step Up or Step Down- We Can't Afford to Wait! 633 Third Avenue, between 40th & 41st Streets. The State Assembly is back in Albany for a conference Sunday, June 14th at 6:00 pm, to hear a report on where things stand and make decisions for Monday. The Assembly is now printing a bill for a short extender, reportedly for two weeks, of everything (rent laws, coop laws, 421-a, lofts, J51, basically everything that is expiring), so it will be "live" on Monday so the Assembly will have the option of passing it. 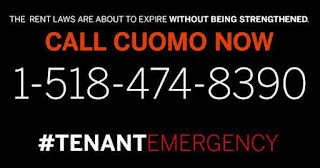 Cuomo has warned against landlords taking advantage of temporary lapse in rent laws. NY Times Editorial: Cuomo has time to strengthen rent protections. Mr. Cuomo said Thursday that he is considering a short-term extension of the 421-a law. A better option would be to let that law expire, but there will no doubt be negotiations about keeping it in some form. As for extending the existing rent protection law without needed changes, that would result in the continued loss of thousands of rent-regulated apartments every year. 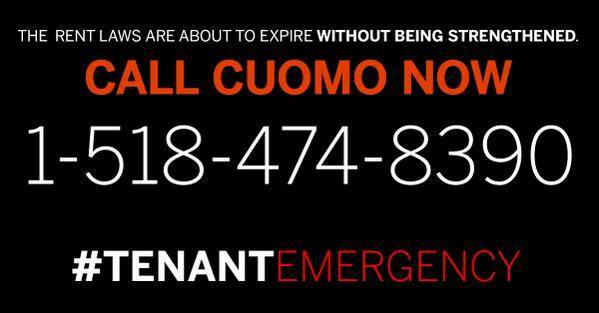 Tenant Emergency: Rent laws expire Monday! Call Gov. Cuomo and Speaker Heastie. Tell him to repeal vacancy decontrol - the motive for landlords to get regulated tenants out. Then contact Speaker Carl Heastie, 518-455-3791 and give him the same message. Cuomo bowing to real estate pressure. Read more to see who wants what, and what we can do about it. Call Cuomo now *518-474-8390), come to Sunday, 6/14 vigil at 6 PM. Tenants and some elected officials in action! Check out this Multihop.TV video of tenants and some of their elected officials in action - explaining, riding to Albany, rallying, getting arrested, all to get Gov. Cuomo to repeal vacancy deregulation so affordable housing will no longer be lost to landlord greed. Having been persuaded to drop "repealing vacancy deregulation" and revising billionaire tax break 421A from his list of musts, Governor Cuomo is giving up the most important thing to save rent regulation. Governor Cuomo: "Step Up or Step Down- We Can't Afford to Wait!" This morning’s announcement by Governor Cuomo that there is “not enough time” to pass stronger rent laws for New York’s 2.5 million rent-regulated tenants is an unacceptable abdication of responsibility and leadership. Less than a week ago, the Governor claimed to be ready to fight for tenants by ending the failed experiment of vacancy decontrol and closing numerous landlord-friendly loopholes that were the product of corruption in Albany. Today, tenants learned that those words were as empty and insincere as they had feared. Governor Cuomo was elected to clean up Albany and make it functional again. Instead, today’s statements are the equivalent of waving the white flag of surrender to corruption and dysfunction. To be clear, if the Governor chooses to show the leadership and commitment that we know he is capable of, there is enough time for him to do his job. There is enough time for him to keep his word. There is enough time for him to do the right thing for millions of rent-regulated tenants in New York City and the three suburban counties who have suffered at the hands of Albany corruption for too long, by passing the stronger rent laws that he promised. The Governor must not surrender his responsibility now.